In the world of real estate it’s all about “location, location, location”. In the world of Outsider Music the corollary would be, “perception, perception, perception”. Jandek has just released a new album titled, “Houston Saturday (2011)”. If this sounds familiar, it should. 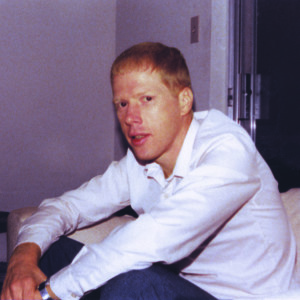 Earlier in the year, Jandek released a live album, “Houston Saturday”. Two entirely different animals. Jandek doesn’t like to make it easy, does he? “Houston Saturday (2011)” is the album this reviewer has pined for. It’s a live album recorded at the Menil Collection on December 17th, 2011. A no-nonsense brace of tunes with only acoustic guitar and voice (save the spoken word opener). This new record has the feel of an intimate studio recording. Indeed, the audience is eerily silent until long, sustained applause is heard after the final song. The sound is big, warm and round. It’s probably the best recorded acoustic guitar sound The Representative has ever committed to record. One can glean from the lyrics that The Representative likes to walk. It’s hard to imagine him driving or taking public transportation. He evokes the image of a black-clad wandering troubadour of the pre-apocalypse, head up, cataloging raw emotions and all else that resides above the horizon; trees, sky, buildings etc….. Which brings me back to the subject of perception. It’s amazing how the unfamiliar can become familiar. After two years of listening and writing about Outsider Music in general (and Jandek in particular), perception and perspective seem to calibrate and shift as a defense mechanism against insanity. I can now listen to Jandek with an unbiased ear, conversely, the James Blunts of the world now send me screaming into the night. Just think about the B-52’s for a second. Remember how off-the-wall they sounded when their first single, “Rock Lobster” came out? The template consisted of shrieking female singers, 35 dollar keyboard sounds, a gay tone-deaf toastmaster and twig-dry electric guitars with no bass. That sound eventually bled into the mainstream and yielded platinum sales and MTV ubiquity. Similarly, one could easily imagine (early 20th century blues artist) Charlie Patton as “The Jandek” of his time and place. The performances on “Houston Saturday (2011)” are surefooted and classic Jandek. There has been an evolution. Some of the tunes are more composed than others. Clearly, Jandek still likes to walk the high-wire and extrapolate lyrics on the fly when the spirit moves him. I’m wondering how musicologist Harry Smith (curator of The American Folk Anthology) felt upon discovering the creepy-crawly backwater roots of the genre we now call American Folk Music. Maybe he felt like I feel when I listen to “Houston Saturday (2011)”. I feel like I’ve plunged my shovel into the earth and hit the slab foundation for a new traditional music; a distant future’s new “Old Weird America”. This is a well thought out and insightful review. I was lucky enough to be at this show.